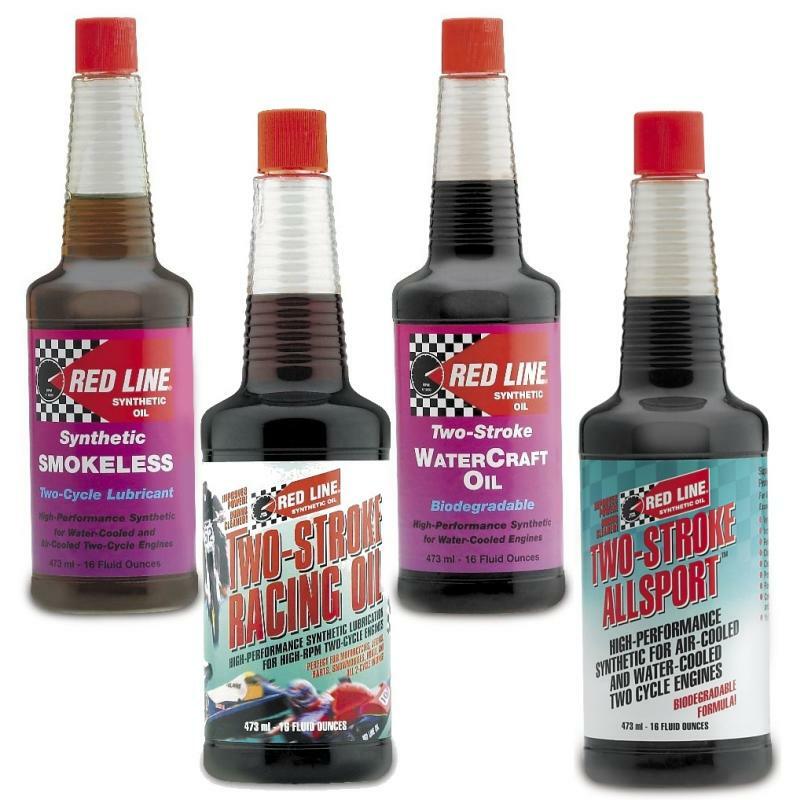 Red Line Oil’s popular two-stroke lubricants contain base oils which have the highest film strength and greatest affinity for hot metal. Because Red Line is a superior high temperature lubricant, it can be used at lower fuel to oil ratios, increasing power and providing excellent scuff protection and cleanliness. Where many two stroke oils are recommended to run at 32:1, many Red Line customers often mix their fuel at a leaner, 40:1. Red Line provides the lubricating qualities of castor oil, but provide exceptional cleanliness, with low carbon residue that dramatically reduces plug fouling and smoke. Red Line provides special protection for reformulated fuels. Dyno proven to make more power over longer periods of operating time. The ultimate in two-cycle performance – provides improved power and perfect cleanliness. Power improvements of 3-5% have been obtained in dyno tests. The high-temperature stability prevents deposits in even the hottest upper ring and piston crown areas. Suggested for use at 50:1, but can be used richer or leaner, up to 100:1 depending on the type of engine and its operating conditions. Provides unequalled protection in motorcycles and marine engines as a premix or injection oil. A biodegradable lubricant designed for air or watercooled performance engines which require a low-ash oil, not an NMMA TC-W3 lubricant. Better production of power, scuff protection and bearing protection compared to petroleums and other synthetics and it’s incredibly clean. Perfect for reformulated and oxygenated fuels. An ash-less biodegradable lubricant designed for water-cooled outboard, personal watercraft and other performance engines which recommend an NMMA TC-W3 lubricant. Better production of power, scuff protection and bearing protection is obtained compared to petroleums and other synthetics and is very clean. Perfect for new reformulated and oxygenated fuels. All Red Line two cycle lubricants are very low smoke products, but with smoke is virtually non-existent with this blend. Recommended where smoke reduction is essential. Available in only in gallon containers, TWO-CYCLE SNOWMOBILE OIL is a low-smoke formula that’s completely bio-degradable and is blended for protection in variable weather conditions. Its rust protection is superior to other oils and is specifically blended to adapt to the latest pump fuels.